Whether you need a design of logo, business card and letterheads, poster, magazine ad, postcard, stickers and labels, promotional flyers, brochures, catalogues, newsletters, displays, invitations, CD/DVD covers, we offer a full range of graphic design services to communicate your message clearly. Here, at Angel's Pen, we work closely with you to ensure we understand the nature of your business and your target audience and to assist you in promoting your company or event. We can help you get the most out of your print budget by providing design that communicates effectively and efficiently. 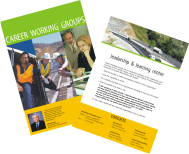 Take a look at our portfolio for examples of our print design. If professional printing services will be required, we will work with you to select a printing service and follow your project to its completion to ensure timely delivery. We can supply artwork to the printer of your choice or negotiate a competitive price on your behalf from a number of established print bureaux. If you are looking for quality and affordable graphic design services, Angel's Pen is what you need. Ready to get started? Take the first step and contact us for your free quote.